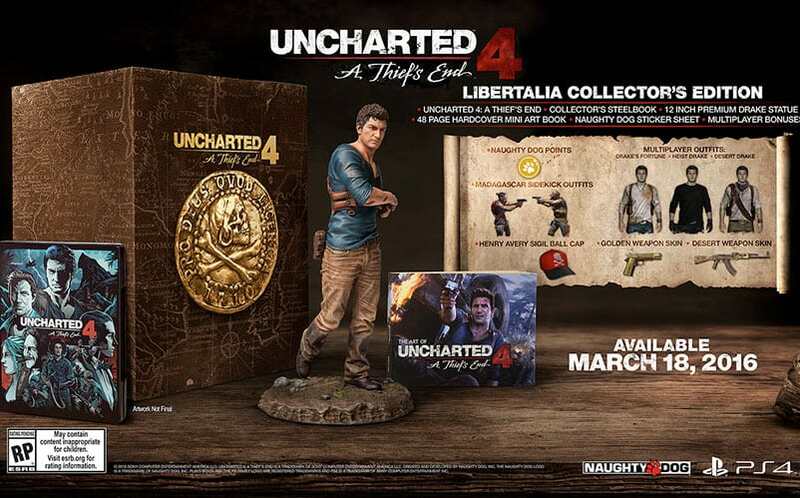 Uncharted 4 Release Date, Collector's Edition Announced | Nerd Much? The official Uncharted 4 release date has been set for March 18, 2016. This release date was announced via a post on the official PlayStation Blog, along with the news and details regarding a Uncharted 4: A Thief’s End Collector’s Edition and Special Edition. 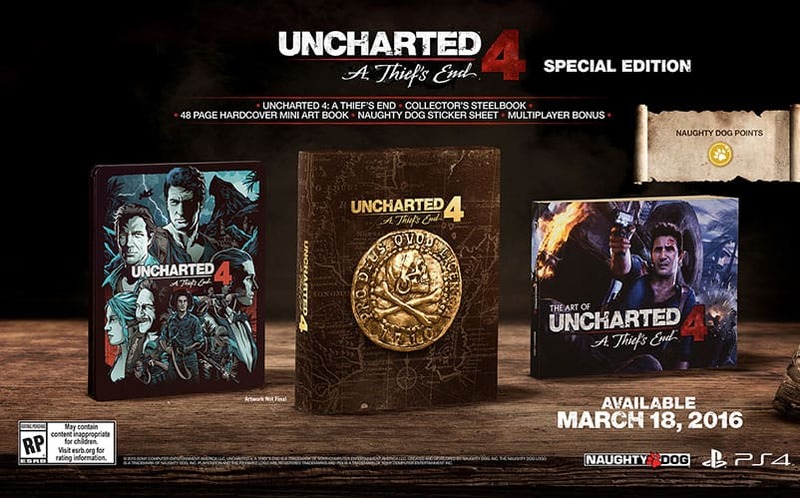 For $79.99, the Special Edition will include a Collectible Steelbox case designed by Alexander Iaccarino, a 48-page hardcover art book by Dark Horse and Naughty Dog, a Naughty Dog & Pirate Sigil sticker sheet, and Naughty Dog Points (in-game currency to unlock various multiplayer content). 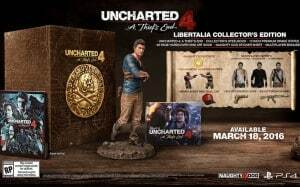 The Collector’s Edition will run $119.99 and will include everything that is included in the Special Edition, but will also include a 12″ premium Nathan Drake statue by Gentle Giant, three multiplayer outfits, two custom weapon skins, a Henry Avery Sigil ball cap and Madagascar Sidekick outfits. There will also be an Uncharted 4: A Thief’s End Digital Deluxe Edition for $79.99 that will include an Uncharted 4 Triple Pack (a single story add-on and two multiplayer packs that will unlock new, rare and legendary multiplayer items. What’s more, GameStop, Amazon and the official PlayStation Store will each have their own pre-order bonuses. Amazon preorderers (it’s a word, trust me) will include a Snow Camo weapon customization and the Desert Drake outfit multiplayer customization, GameStop will give the Multiplayer Booster Pack that will unlock a variety of one-time use multiplayer boosts, and the Phurba Dagger Taunt based on Uncharted 2: Among Thieves.